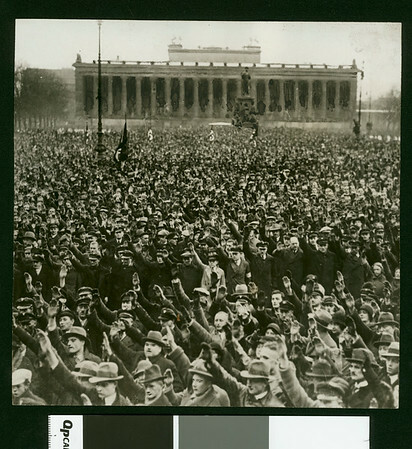 Photograph of a crowd gathered in Berlin during the Nazi's political rally. "Huge throngs gathered in the Lustgarten in Berlin enjoying a political rally of the National Socialists during the recent German elections. These monster gathering reveal the interest taken in politics throughout Europe. In the accompanying article, Paul Painleve declares solutions of many world problems await the result of elections in both Germany and France during the coming month" -- Examiner clipping attached to verso, dated, "Apr 10, 1932".